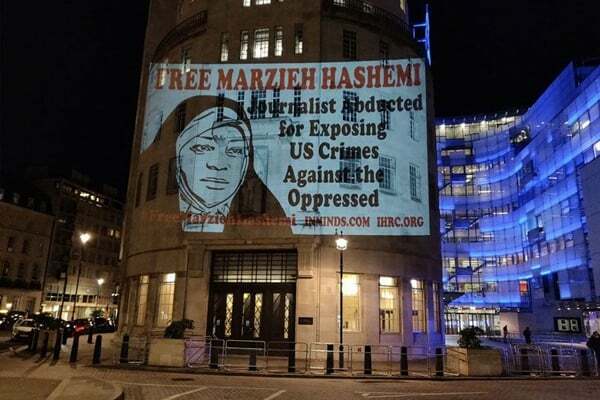 An Islamic rights group has projected a placard on the BBC building in London, in a protest at the sudden arrest of Maezieh Hashemi, an anchor and journalist affiliated with Iran’s English-language news channel Press TV. An Islamic rights group has protested the arrest of Hashemi, the Press TV’s anchor, on the BBC building in London Friday night. Hashemi was arrested Sunday at the St. Louis airport on a visit to see an ailing family member, Press TV has announced. The placard, projected by the Islamic Human Right Commission, a London-based rights group, called for the immediate release of Hashemi. “Journalist who has been abducted for exposing US crimes against the oppressed”, the placard said, protesting the reported mistreatment of Hashemi at the hands of the US police. Masoud Shajareh, the chairman of the rights group, told IRNA on Friday the commission has sent a letter to UN human rights rapporteurs, voicing protest against the arbitrary arrest. Hashemi, born in the US in 1959, converted to Islam and moved to Iran following the 1979 revolution of Iran. Iran has protested the arrest of Hashemi calling on the US to disclose the basis for her detention. A US court on Friday confirmed the arrest of Hashemi saying she is not accused of a crime, but her testimony is required over an unspecified case, AFP reported. The order said that Hashemi was arrested on “a material arrest warrant” in a case in Washington. She will be released after the completion of her testimony to a jury investigating unspecified “violations of US criminal law,” the statement said.